I am really confused by some of your assertions,and wonder how much you know about how the various programs work. What makes you think you will pay for other people's kids to go to college because they haven't saved enough where you will have? Do you understand how financial aid is calculated, and more importantly, how it is given? The FAFSA forms typically use income and not assets and savings to figure out how much a family can contribute, although quite a number of private schools also ask for additional information through the CSS Profile that also looks at assets including savings. In addition, the vast majority of aid is given as loans which must be paid back. So would you prefer your kids to have a lot of loans like someone who hasn't saved, or would you prefer they start out without all of that? That's the real difference. Also, I preferred that my kids got to choose schools based on where they wanted to go and not who gave out the most aid and were the only places they could go due to the financial considerations. Wouldn't you rather your kids be in that position as well? As far as confiscating your retirement savings, I'm really hard-pressed to think Congress would ever agree to that, especially as it seems difficult for them to agree on much of anything at all. If you really think this is where things are headed, then don't save and see if you are right and can be the beneficiary of all those hand-outs you seem to think will be available to people retiring. I prefer not to take such a gamble, or to take the chance that you are right and I would lose my savings to such a taking as I'd still rather be in that position than the one where I have to hope that there are enough programs to support me in retirement, although I highly doubt it would be much in the style I would prefer, and think it is more likely to be subsistence level. I watched my FIL have to live on all of those programs because he had nothing, and it is not a life I would ever choose on purpose, so I will continue to save for my retirement. I'm sure others will offer more thoughts. but i am going to end up paying for my kids' educations ( have 2 kids) as well as other peoples' who haven't saved, and also paying for other peoples' retirement who haven't been as disciplined (within 20 years, is it really likely the government will confiscate my 401k and ira (we max out both, but make sacrifices to do it!). Forgive me, but that just sounds like my almost-teenager whining about why he can't have a Playstation 3. When he already has a Wii and an Xbox. Care to restate your concerns? The point? No matter what the politicians decide down the road, you're going to be better off by saving. 1st off, it doesn't have to be 'either/or'... I'm building up tax-free funds I can use either direction with an IUL instead of traditional qualified accounts. You'll hear great gnashing of teeth about these here... but when put together properly they outperform in the vast majority of markets at a fraction of the cost overhead. 2nd, depending on how soon your kiddos are likely to be ready for advanced education, there is a rapidly growing movement away from traditional college education and toward individualized technology-driven education. The old standard prestige/stigma of *where* you got your education will be replaced by where and who you have apprenticed with while running through self-study coursework. The future is bright... and *YOU* do not have to be the last person in the college tuition musical chairs fiasco! The foundation to pick up the impending implosion/popping of the college tuition bubble is quickly forming in place! Yes, financial aid has lots of payback criteria...until The One figures out how to forgive it all...you don't believe it's possible? 401k's...there have been serious discusions on how to end the benefits "because they aren't fair" and also talk if government seizing the assets and replacing with gov sponsered plans similar to SS...you haven't heard of this possibility? I'm not sure what Dave means about an IUL being used to fund college educations. Perhaps he will explain. I think the insurance industry doesn't do an effective job of educating the public about IULs. Perhaps they'll get better as our country's fiscal crisis deepens. I'm kinda liking the Obamanomics. I sold a bunch of dividend paying stocks last week so that I can make sure I qualify for a big Obamacare rebate. It will be nice to ride in the cart after a long career of pulling one. It sounds to me like your operating from fear instead of facts. 401k plans (and IRAs) are nothing more than long-term tax arbitrage. Avoid current income taxation in exchange for income tax payments down the road. The theory being that you're in a higher tax bracket when working than after you retire. Roth IRAs and 401ks provide for those who think their taxes will be higher in retirement rather than lower. So both positions are covered. The benefit to society being that if you are encouraged to save for your own retirement through a bit of a tax break, you are far less likely to need public assistance when you do retire. I don't know how anyone can consider them unfair by any means. At worst, they are some social engineering mashed into the tax code. At least at this time, the State of California awards a free ride to California State University for any high school senior who graduates with a 4.0 grade point average. That's a completely free ride: tuition, books, parking...the whole enchilada. An alternative would be to start one's higher education at a junior college and then graduate from a better known university. 401k plans (and IRAs) are nothing more than long-term tax arbitrage. Unless one's employer matches, there are much better ways to save for retirement than either of these two plans. An IUL is one, in my opinion. I'm kinda liking the Obamanomics. I sold a bunch of dividend paying stocks last week so that I can make sure I qualify for a big Obamacare rebate. It will be nice to ride in the cart after a long career of pulling one. A bachelor with no children and thus no concern for the generation coming after him would say that. I think the insurance industry doesn't do an effective job of educating the public about IULs. No. They try, oh how they try. Problem is, no matter how much you try to polish a t*rd, it's still a t*rd. ~ Never take a market loss" You really believe this? The risk is an integral part of the market--there is no way around it. It can only be shifted around, not eliminated. So if you are wanting to avoid the risks, it can only be done by shifting the risk to somebody else. That party is not about to take on your risk for free, they expect to be paid for taking it. Which means that you CANNOT get market returns with no risk. You can, however, get the illusion of achieving market returns without market risk. But that's only an illusion, not reality. In truth you will be paying a pretty penny for that illusion. If you been "studying Indexed Universal Life (IUL) products intensively", then you seem to have completely missed all the articles and papers that discuss the negatives of them. Not so. If you have $1M in assets beyond your primary dwelling, then they figure you are good for over $60,000 per year towards college. Even with no income at all. So no aid, even at the most expensive colleges. Check out the aid calculators. The first thing I recommend is turning off Fox News and some of those right-wing bloggers. Oh, I've read them alright, as well as lurked at numerous discussion boards about this topic. The main concerns seem to be the cap on gains and the fees charged by insurance companies. Well, if one has a concern about the upper cap, seek an IUL that has a high cap, such as Allianz Life Pro+ whose key features are its 17% cap and 5.3% guaranteed participating loan rate. The fees for an IUL are lower than mutual funds, retirement plan administrator fees and probably trading in your own account--if you're smart enough to beat a 17% annual ROI. Yes, I do believe it. An insurance product is a contract between the insurance company and the insured. The insurance industry has higher reserve requirements than even banks. If an insurance company says your gains remain your gains and if the market takes a dive your principal is guaranteed, then that's exactly what's going to happen. I think your "too good to be true" mindset may be keeping you from fully investigating an alternative investment plan that can benefit you. And, no, I don't think the insurance industry is doing a good job of educating the public about IULs. One rarely sees commercials about this product and the ones we do see aren't very detailed. The FAFSA forms typically use income and not assets and savings to figure out how much a family can contribute, although quite a number of private schools also ask for additional information through the CSS Profile that also looks at assets including savings. I think you're mistaken. If you have assets, they figure you can use them to put your kid through college. At least when my son was applying for aid, they sure used my assets against me and him and now he has college debt. If you have $1M in nonretirementassets beyond your primary dwelling, then they figure you are good for over $60,000 per year towards college. Even with no income at all. So no aid, even at the most expensive colleges. The IUL simply grows & spends tax free, on whatever you want, whenever you want, as little as you want, or as much as you want to the limit of what you've got. You don't have to worry about saving for the kid's college versus your own retirement. You may want to strategically consider how you will SPEND your funds, but that won't be because you accidentally trapped your money in one single-use inaccessible account versus another... all your money is politician-string-free in terms of how, when, why & how much you choose to use it. As for market gains without market risks... its not too good to be true, and anyone could DIY if they wanted that as a result. Its virtually impossible on a DIY basis to outperform the large companies that offer it though, because on a DIY basis you have to build your own safe returns portion of the trade with "new money trades" where the large, established companies let you roll your money in on their "old money trades" and get the benefits of their higher returns. If you have $1M in assets beyond your primary dwelling, then they figure you are good for over $60,000 per year towards college. Even with no income at all. So no aid, even at the most expensive colleges. Do you think it also unfair that those who have emergency funds spend it when they experience, you know, an actual emergency, as opposed to those spoiled non-savers who get to put it on a credit card and pay it off over months or years? When you are head of a college financial aid office, you can give need-based aid only to rich people and let those with less than a million smackeroos apply for loans. I guess that's one memorable way to teach that those what gots, gets. PS--What percentage of parents of 18-year-olds have a million bucks in savings, d'ya think? I bet you can count 'em on the fingers of one hand. Possibly 1 finger is too many. Those poor people! B) (Much fewer) Critical assessments of IULs blind to product design... assuming the least effective structuring for any random person. There are zero negative writings that I have found (and I've seen most, if not all) that stand up to a specifically detailed inspection. IULs aren't a one-size-fits-all panacea... but for the vast majority of situations, when properly fit to the specifics of the investor considered, they really do outperform the alternatives. Where can I find comparisons of costs, of the insurance, sales (upfront and on-going) as well as internal investment costs? I've found these difficult to find. The main concerns seem to be the cap on gains and the fees charged by insurance companies. And that the indexed gains are the raw S&P index price, EXCLUDING dividends. That's huge. That's on the magnitude the old saw "Other than that, Mrs. Kennedy, how was the parade?" Does anybody who is pushing these do anything as simple as looking at the historical prices? Stupid question--of course not. 'cause they'd see that from Mar 1987 to today, $100 in the S&P price-only grew to $436. But including dividends it grew to $813. So, yeah, over the long haul the IUL company keeps a lot of your money. They keep so much that they can easily give you a meaningless guarantee. Oh, and that $436 is BEFORE their various fees and caps. Not to mention the time-periods (frequency) in which they apply the cap. Bah, all this has been hashed and re-hashed again and again. The phrase "willful blindness" comes to mind. Hysteria - the government will confiscate your IRA? Stop watching the news and reading people on the internet and calm down. Look - you can have whatever priorities you like. At your income you can save for both. It's great to pay for your kids education and spare them loans (my parents did), and you should definitely be saving for retirement (my parents did, and I do). If you are tired of saving and just want to blow your money because you are in a snit over some imagined future, have at it. But it's foolish (with a small "f"). Having money in the bank at retirement will allow you many more options than not. I find part of that true and part false. The true part: "... that I have found...". The false part: "zero negative writings .. that stand up"
Although I will agree with you that most of the articles are very short and non-comprehensive, and many are written by journalists who are short on knowledge. But then, you don't really need every warning column to go into great detail, when a simple "Do not play 3-card monte with a street artist." will do. IULs are complex financial instruments. Funny thing is, they put the warning information right out there in plain view, but almost nobody recognises it. "Indexed universal life uses the S&P 500 index. (excluding dividends) as the benchmark for crediting their cash value." All it takes is for a quick look to see the effect over a long term. Over the last 25 years, the return without-dividends was HALF the return with-dividends. Actually, worse than that. $100 grows to $436, for a profit of $336. $100 grows to $813 is a profit of $713. In addition to the fees & caps -- which in themselves cover all the company's expenses -- they keep 53% of the profit and give the customer the remaining 47%. That's a hell of a racket. No wonder they can provide a "guarantee". Every IUL illustration will fully break out all costs & charges. The mortality charges vary, of course, relative to the physical state of the person selected as the insured, but everything else can be compared to other alternatives. As a broad-brush, the annual average of all charges inclusive, will be around 150 basis points by the 15th year, and under 100 basis points by the 20th year. That's assuming a tax-free growth & distribution account that is matching 100% to 140% of the annual upside of a single or blend of indexes. If you want to make objective apples-to-apples comparisons (always a good idea,) its best to have an optimized illustration worked out for a specific case, for the various providers you want to compare. "So would you prefer your kids to have a lot of loans like someone who hasn't saved, or would you prefer they start out without all of that?" Is it possible to have substantive college savings, but still get the loans upfront, and then just pay them back once the student graduates? Use the loan money up until the point you have to pay interest, then pay it back in full? Just wondering if the "process" allows it? "I'm curious what peoples' strategies or thoughts on college savings are, and how you are hedging for the future...."
Does anybody who is pushing these do anything as simple as looking at the historical prices? 'cause they'd see that from Mar 1987 to today, $100 in the S&P price-only grew to $436. But including dividends it grew to $813. A) what was the liquidity/volatility risks? B) what was the after tax returns? C) what were the costs to neutralize #A & #B in order to make it apples to apples? The IUL company doesn't "keep any money" from the trades. Again, you could cook it yourself, you just can't get returns to compete with their existing long-term yield portfolios to anchor the safe leg of the hedged trade. "Indexed universal life uses the S&P 500 index. (excluding dividends) as the benchmark for crediting their cash value." Actually, a single S&P500 account allotment is almost always available, but not the best more most stable performing choice. Usually an index blend is better. All it takes is for a quick look to see the effect over a long term. Indeed... talk is cheap... above are examples of actual results. Not after taxes, fees, and costs of hedging to nullify volatility. Not anywhere near close. Fees cover the companies' expenses, but caps are simply relfective of the hedged trades put in place. The companies don't take any margin out of the hedge trades. they keep 53% of the profit and give the customer the remaining 47%. That's a hell of a racket. No wonder they can provide a "guarantee". Math isn't a long suit of this argument, unfortunately. There are simply no outperforming alternatives available to the retail investor with the same features... not even on a DIY basis. If there were, they'd be trotted out here... but the silence tells it all. Here is my $0.02, FWIW. With the political environment the way it is, it is very easy to feel like you're prosecuted for saving, planning, and achieving. Trust me, I know, I'm a 1%er. I've worked hard for what I've achieved and accumulated and I hate all the government handouts/confiscations of ALL types. But you'll have to put those feelings aside and try and look at things logically as possible. #1 - save for your retirement first. IRAs, 401ks, and taxable accounts, max out the first 2 and then start on the 3rd. Having monies being treated differently tax wise can be a good thing. You won't have the best case scenario but you also won't have the worst. When it comes time to retire, you will have options which you won't have if you don't save. #2 - you and your kids should read "The Millionaire Next Door". Basically getting rich is about working hard and primarily working for yourself. A college education is overblown except for two fields: medicine and law. Also, higher education is undergoing a change, online college. It is yet to be seen how this will play out and how those degrees are accepted but it is definitely a cheaper alternative. #3 - is college necessary? If yes, and you've taken care of #1, then maybe you save a little for your kids college. There is nothing wrong with them working their way through school. Summer jobs and staying at home going to the local college/community college makes things cheaper. Don't forget scholarships, there are plenty. I'm not talking "covers everything free ride". There are plenty of $100, $500, $1000, etc given by banks, stores, societies, cobble a few together and you have a good sum. Your high school councilor should have a long list of available scholarships to apply for. #4 - yes, student loans/forgiveness is the next financial bubble. #5 - trying to guess what the laws will be like 5, 10, or 20 years from now will drive you nuts. Plan the best according to today's laws, then when they change, re-evaluate. #6 - if you really want to give in to your conspiracy theories and imagine yourself as a Jew in the 1920-30s Germany, start saving some gold coins. A backpack of $250,000 weighs around 8 pounds at current prices. A trusty shot gun, some ammo, and some provisions and you can cross the border somewhere and start over. You seem to be confused and defensive. I don't write anything about colleges considering assets when figuring financial aid is unfair -- I think it's perfectly reasonable. I was just pointing out that you were wrong when you said that aid is pretty much based only on income. Quite so. I was not precise enough. Perhaps it's because I tend to think of money in retirement accounts as not really existing. Um, no crying here at all. Rich folks don't need a discount. I didn't say they ought to get any aid. Are you responding to somebody else? (a) I didn't say anything about financial aid (you confused me with someone else), (b) You are the one distressed about someone getting a better deal than you might get in the future. I can't imagine feeling so paranoid. Yes, your kids can take out unsubsidized loans, and I think are entitled to some specific amount that goes up from freshman to senior year, but as these are unsubsidized, interest will accrue from the first day although payments are not due until graduation. Similarly, I think you can take out private loans, but those might have to be taken out by the parents. I'm really not sure because I didn't see a purpose to having my kids accrue interest while they were in school since we had saved and could pay for their college. I've only got one payment left (DS has trimesters) and then I'm done with college tuition. I did make the mistake of adding it all up the other night to see how much it has cost us over the past 4 years. We are right about at the estimate we thought we'd spend, and we could have bought a house for cash in some parts of the country with what we just spent. I'd do it all again in a heartbeat, however, as this is a gift we had always planned to give our kids, and we saved accordingly. I realize that other people prefer other paths, but I did see some of their friends doing the mad scramble because hoped-for financial aid did not come through, and I was very glad my kids didn't need to do that.
" I'd do it all again in a heartbeat, however, as this is a gift we had always planned to give our kids, and we saved accordingly." "but as these are unsubsidized, interest will accrue from the first day although payments are not due until graduation." Thx for clarifying. For some reason, I thought that interest did not start accruing till the student graduated. Looks like I have some research to do. That was because the residents of your state were willing to tax themselves to pay for other peoples' childrens' education." That may be, but nonetheless, I still consider myself lucky. Walking out of college with no student loans was a great way to get started saving and investing. My only retirement investing regret was that I wish I spent less in the local bar in my early 20's, and invested that money. Good Lord. That's more than I'm drawing annually from my portfolio in retirement. I guess you could say I'm living comfortably on the money I'm not paying to an insurance company or "leverage planner" in fees, expenses and costs. Good Lord. That's more than I'm drawing annually from my portfolio in retirement. I guess you could say I'm living comfortably on the money I'm not paying to an insurance company or "leverage planner" in fees, expenses and costs. Right on! If you've got enough that you can support your lfiestyle on less than 150 bips of your basis per year, regardless of drawdown volatility & taxation, there's no reason to pay for such protection. I'd be the 1st to advise to just hang it all out naked & enjoy the ride! Intercst, I don't agree with your politics, but you are dead on point when it comes to this issue. I'm sick and tired of rip off financial advisors, just as I'm sick and tired of dumb a$$ politicians of both parties in DC. To hell with them all. As a broad-brush, the annual average of all charges inclusive, will be around 150 basis points by the 15th year, and under 100 basis points by the 20th year. Plus they keep all the dividends. And that little thing right there means that you only have HALF the money you should have on the 25th year. Plus they play games with the caps. Sure, they generally lay it all out, but people don't know what it means. Most people don't realize how often they'll get capped, or how badly they'll get clipped by the cap. According to [ http://en.wikipedia.org/wiki/S%26P_500 ] the S&P had an annual return of more than 16% in 10 of the last 24 years. 7 years had more than 25%. Oh yeah, don't play 3-card monte with a street artist. Yes, sorry, it was 2gifts who originally made the misstatement about financial aid being based almost entirely on income. It would be nice if you didn't ascribe to me things I didn't say, especially in such a nasty way. And then follow it up with bad numbers: as there are about a million US households with net worth of $5M or more, I bet at least a few tens of thousands fit the profile of getting no aid due to their assets and regardless of their income. (b) You are the one distressed about someone getting a better deal than you might get in the future. I can't imagine feeling so paranoid. Yeah, that's what I mean. I wrote nothing like that, and I can't even tell what you are imagining. I'm not sure who you think you're talking to, but it doesn't seem to be me. Perhaps I shouldn't respond. Yes, it's time to stop. You might want to consider expressing yourself more politely. Plus they keep all the dividends. Plus they play games with the caps. According to [ http://en.wikipedia.org/wiki/S%26P_500 ] the S&P had an annual return of more than 16% in 10 of the last 24 years. 7 years had more than 25%. I've already shown (just upthread) the superior performance of the IUL, given the caps & floors, versus the naked index. And don't try to teach a pig to sing... its a waste of time, and the pig just gets frustrated... right? While researching retirement investing products as well as various derivatives offered to retail investors in Germany, I have come to the conclusion that any but the most basic, transparent constructions usually come with enormous hidden fees that quite often make it difficult to even beat inflation in the long term, let alone have any real returns. What happens to dividends is quite often a sticking point. There is one type of German retail derivative I can recommend for long-term investments - a certificate on German performance indexes. Primarily the DAX performance index. This derivative issued by Deutsche Bank mirrors the performance of the German DAX (including dividends) and has absolutely no costs for the investor. Dividends are not taxed (except as gains once you sell). It has no fixed maturity and will likely run as long as the Deutsche Bank exists. I don't think Deutsche Bank makes any money on this particular product (I don't see how). Deutsche offers a lot of other products which are tremendously expensive, however. I think this one is a loss leader. The one disadvantage is that if Deutsche Bank goes bankrupt, you are an unsecured creditor. For some reason, I thought that interest did not start accruing till the student graduated. It used to be that way and was changed around 1993-94, IIRC. Too I think payment deferral rules changed too as to what was considered "graduation". Had several friends in residency training that had $100k plus student loans at the time and were starting to get hammered with interest accrual. A few were having to moonlight insane number of hours because they now had higher loan payments on a $30k salary. I have no dog in this fight, but I must say that those who are arguing against Dave and IULs do not have a good grasp of how they function. 1. Your princial is guaranteed and the company uses it to invest in high quality/safe bonds. 2. The interest generated by those bonds is used to purchase an "at the money" call option on your chosen index (often the S&P) while simultaneously selling a call option with the same maturity on the same index. This "short" call represents the "cap" on your potential gains and its strike price is typically about 15% higher than the long call. 3. At the end of the year, your long call option will mirror the percent gain in the underlying index and your account will be credited that amount up to the cap - any gains above the cap will be offset by a corresponding loss in the short call position. 4. If the index return for the year is negative, both call options expire worthless and you are left with your original prinicpal. 5. This process will repeat itself year after year - capturing the gains of an underlying index up to a certain cap, but never losing any of your principal. Now what may change is a) amount of interest income that can be safely generated by the company from your principal amount to purchase the options and b)the cost of the options based on market volatility. So..the company is not pocketing the dividends for themselves. No one in the above strategy actually owns the underlying equities and is therefore not entitled to the dividends. If you are going to point out that the "cap" on gains is a negative because the S&P often rises more than 15%, you must also point out that the "floor" (no loss of principal) is a positive - as I believe the S&P returns are negative about 1/3 of the time. With these products you certainly run the risk of the cap being reduced. The cap will be determined by the cost of the underlying options. And those options must be purchased from the interest generated by company's portfolio of bonds. Current interest rates on government and AAA corporate bonds are at historical lows - however, they could still go lower. I have no idea whether the current option prices are historically high, low, or average. Given the fees, cost of insurance, and predicted returns, I leave it to each individual to determine whether IULs make sense as an investment vehicle. But before criticising a financial product, I believe you should understand how it functions. I've worked hard for what I've achieved and accumulated and I hate all the government handouts/confiscations of ALL types. But you'll have to put those feelings aside and try and look at things logically as possible. #1 - save for your retirement first. IRAs, 401ks, and taxable accounts, max out the first 2 and then start on the 3rd. Having monies being treated differently tax wise can be a good thing. Isn't that a form of "government handout"? Don't misconstrue the government taking less of MY earned money as a "government handout". Getting money for something you didn't do is called a handout. Now, as far as taxes, personally I"m for a flat tax. Saving for retirement is MY responsibility, there should be no government incentive. Same for charitable contributions if you're curious. However, if I legally take advantage of the law, its not your problem nor your business. BTW, did you send Uncle Sam a bonus check, i.e., extra taxes beyond what the law legally called for? If no, why not? There is no law stopping you. Essentially, subsidized loans work like you thought where the interest is paid by the federal government while the student is in school, and so the portion the student pays does not start to accrue until after graduation. These loans are based on need, and were probably what you had in school and were certainly what I had in school. Unsubsidized loans, which is most likely what your kids would get and would have been what my kids would have taken out, have the interest accrue from the date of borrowing, and the student is responsible for all of the interest, although payments are not due until graduation. It's for this reason that I did not want my kids to have to take out loans. Instead, they are responsible for books, spending money, car insurance (they drive our vehicles) and gas, which seemed like enough skin in the game for us. We also opted to pay for 4 years at any school of their choice, and they did know that while looking. Where you are planning on funding 4 years of a state school, I would just suggest that you make sure that they know that early enough so that they can plan for that, and if they need to do things like get a job to save up or work extra hard on their grades or whatever, they will know that and can take appropriate action. Excellent synopsis of how an IUL works in general. Current interest rates on government and AAA corporate bonds are at historical lows - however, they could still go lower. The big benefit of putting on this trade with an IUL provider is their trailing returns from an "old money" general account. These accounts are from a few billion to nearing a hundred billion large (depending on the companies) and are carrying old bonds & commercial real estate loans yielding around 6.5% to 6.8% currently. New IUL buyers' money gets the benefits of the existing general account yield, versus new money yields for DIY or retail investors in the 1% range presently. The large corporate accounts "turn over" about 15-20% per year due to maturities and new money dilution... so the net aggregate yield ends up being a "trailing average" that may continue to drop if current new money yields remain as low as they are now for a further extended period of time. In *ALL* cases, however, new money will get greater yield from participating in the IUL corporate ("general") account yields than on a retail investor or DIY basis... UNTIL safe rates begin climbing again significantly above the general accounts' longterm trailing average yields. Of course, whenever that occurs, the tax code allows existing IUL owners to rebalance their cash balance via collateralized loans at a fixed rate in the 5-6% range, to place into new money fixed yields in much higher rates for a guaranteed positive arbitrage. I have no idea whether the current option prices are historically high, low, or average. I don't personally use these exclusively for my own family's money... I still have a significant chunk in wrap accounts with a highly skilled manager (who many TMFers know,) and juggle a bit of my own particularly for sharp opportunity exploits in real estate. But the largest chunk of my family pie is growing in IUL strategies... there are just no superior choices, given the features provided. *MOST* importantly, relative to the OP... I see *NOTHING* in *ANY* qualified college tuition plans that come anywhere close to what the IULs provide. Its a non-competitive conversation. You'll NEVER catch a librul doing that. Even Buffett won't do that. Libruls are all hat, no cattle. They don't all use the S&P 500 index solely. They don't all exclude dividends. While researching retirement investing products [...] I have come to the conclusion that any but the most basic, transparent constructions usually come with enormous hidden fees that quite often make it difficult to even beat inflation in the long term, let alone have any real returns. How many IUL policies have you actually read from cover to cover? I would put good money on "none." I've read several, cover to cover, and I tell you that you are wrong. "The market index" could just as well be a random snail trail back & forth across a post-rain sidewalk. What matters is the bottom line results, which (on a risk, cost & tax weighted basis) outperforms the alternatives in the majority of markets for the majority of users. What do you need the insurance company for? ..."What do you need the insurance company for?" Well technically you do not; you could set up something similar for yourself. However, I believe wrapping the investment into a UL policy offers the following benefits. 1. I suspect that the companies have better access to investment grade bonds and other fixed income securities that a retail investor may not. In addition, they are guaranteeing you principal, whereas an individual investor will have to eat the cost of any defaults. 2. You would have to set this up within an IRA to obtain the same tax free compounding. 3. If you do this in a traditional IRA, you will have to pay taxes on the withdrawls. 4. The best vehicle to use would be a roth IRA, in which case you are starting with after tax dollars (the same as you would be funding an IUL with). You would then be able to take tax free withdrawls - which would mimick the tax free loans that you can take from an IUL policy. 5. In an IUL you are able to access the principle and any gains at any time via tax free loans. The roth IRA would only allow tax free access to your contributions before age 59 and a traditional IRA would make early access to your funds even harder. This may be a minor point if you are absolutely planning to use the funds in retirement. But, given that much of this thread has discussed saving for children's college, an IUL would allow easy access to your money to pay for such - whereas the IRAs are not well suited for that (unless you began reproducing in your 40s). Those are the advantages that I see of using this strategy within an UL policy. Again whether those benefits outweigh the policy fees and the cost of insurance (which may be of little use or even a complete waste to certain individuals), is a complicated question. Given that I am not a financial advisor, licensed insurance salesman, accountant, or lawyer there may be some errors in my above assumptions. Not that anyone asked, but from my perspective, IULs are very complicated financial products that are probably not suited for most people. The average individual is probably better off maxing out their 401K/IRA contributions, setting up a 529 plan for their kid's education, and buying a reasonable ammount of term life insurance. However, for that subset of individuals that is already maxing out tax deferred retirement options and has the rest of their financial house in order, it seems like IULs offer an interesting option for tax free growth and distribution of wealth - during one's life or even across generations. Not quite 1/3 of the time, the 12-month return is a loss. So the floor of a IUL comes into play and you don't get hit by those losses. But...well, look at that, 1/3 of the time the return is above 15%, so you hit the cap (assuming a 15% cap), and you miss out on all the gain over 15%. Not so good. You get the 15%, which is good, but nothing more. Sooooo, just how much gain is foregone? Surely it couldn't be much, right? Wrong. But first, let's look at those 28% of the time when the S&P had a loss. The average loss was -13.6%. Cool -- about a third of the time you ducked an average loss of 14%. Yipee. Okay, so how about the magnitude of the gains in excess of the cap? Hmmmm. One-third of the time you got capped at 15% and left 11% on the table. You do a little happy-dance, but it's rather muted because you didn't get that other 11%. Hmmm, I wonder where it went? The market returned 26%, I got 15%, but where did that other 11% go to? Maybe it went to offset the losses when the floor got hit? S.W.A.G. = 33% of the time the excess gain was 11% and 28% of the time the avoided loss was 14%, so using handwaving fuzzy math that's pretty close to a wash.
SOMEBODY took the loss when the market lost, and if it wasn't you then it was the IUL company. Likewise, SOMEBODY got the excess gain, and if it wasn't you then it was the IUL company. 'course, the total return of the S&P500 is not just the price. It also throws off dividends, about 2.6% a year average. The dividends come like clockwork, irregardless of any loss or gain in the share price. We don't get any of that, since [almost] all IUL's exclude dividends in the returns credited to you. The market paid a dividend and SOMEBODY received it, and if it wasn't you then it was the IUL company. 2) the much higher allowable contribution limits on inbound tax-sheltered capital (over IRS qualified schemes,) and no timing nor amount demands nor restrictions on tax-free funds distributions. 3) the best performing index blends require bank-traded, non-retail option spreads... you can't get them done at CBOE, and a DIY investor is extremely unlikely to have the volume & capacity to get executions through the bank structured-options trading desks. 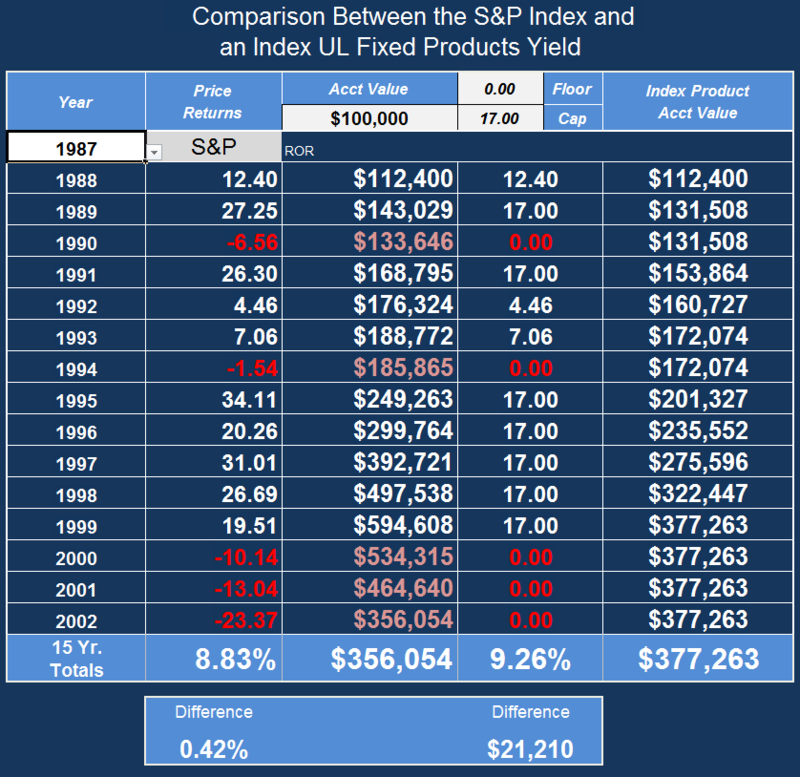 I'm juggling a toddler, so can't run historical actuals... but if anyone asks, I can, and the IULs (at a 0/15 cap spread) handily beat the single-index S&P in the vast majority of rolling average periods from 10, 15, 20, 25, and 20 years, back since S&P inception. You do a little happy-dance, but it's rather muted because you didn't get that other 11%. Hmmm, I wonder where it went? The market returned 26%, I got 15%, but where did that other 11% go to? Maybe it went to offset the losses when the floor got hit? The hedge trade requires buying a long call at or near the money, which costs more than the fixed yield leg provides in call buying budget. The person who gains from the market rising higher than the IUL cap is the counterparty that the IUL company sold the short call option to at the high end. That party purchase the right to participate in the market from that strike upwards. S.W.A.G. = 33% of the time the excess gain was 11% and 28% of the time the avoided loss was 14%, so using handwaving fuzzy math that's pretty close to a wash.
Not even in the same universe as a wash. The IUL trounces the unhedged trades in the heavy majority of rolling periods. The reason the "handwaving guesses" fail is because a 25% loss requires a 33% gain to simply "break even." Looking at just a column of annual returns and assuming that 'half up, half down, is about equal' is exactly bleeding in losses. Look at the columns, and hand-wavers assume a wash. The math hurts in the real world of money though. Nope, and nope. The IUL actuaries perfectly hedge the trade... they only make their money from their fees, that's it. Nope, the dividends are baked into the option pricing. When dividends are strong, they reflect in more attractive option performance per cost, allowing the IUL company to buy a spread with higher caps. Nobody is surrendering the dividends of the securities of the underlying positions. As a general comment ... we happen to know how the insurance company effectuates this (the same basic way that these articles outline), but that doesn't matter. In the IUL contract, there are only 2 parties, you and them. *How* they manage the investment is their concern, so these side discussions of buying options, etc. have no bearing. They could be buying Russian Yak milk futures for all we know. It doesn't matter and we don't care--they just are obligated to pay us based on the S&P500 index. Nonetheless ...... the market pays dividends. If you own the stock you get the dividend. If you are short the stock then you have to *pay* the dividend. If you buy an option (as we assume the insurance company does) then some counterparty had to sell the option, and is therefore in a short position in the stock. Which means that they have to pay the dividend. Which they are not about to do, not going to pay out a dividend from their own pocket. They are not handing out free money. If you trace down all the details of the stock and the derivatives (the options), you'll see that if the stock pays a dividend, then all the various owners of the longs and shorts and options on aggregate receive exactly that dividend, perhaps directly, perhaps indirectly. This is a roundabout way of saying that even though a call option doesn't explicitly pay the dividend, the dividend is taken into account in price of the option. The total return of the stock includes the dividend, and likewise the total return of the option includes the effect of the dividend. "Since whoever owns the stock as of the ex-dividend date receives the cash dividend, sellers of call options on dividend paying stocks are assumed to receive the dividends and hence the call options can get discounted by as much as the dividend amount." IOW, when the ins. co. buys a call, they get the dividend not in cash but as a discount in the price. They get the dividend, and not you -- because IUL contracts are written to exclude dividends. When dividends are strong, they reflect in more attractive option performance per cost, allowing the IUL company to buy a spread with higher caps. Nobody is surrendering the dividends of the securities of the underlying positions. IOW, the ins. co. gets the benefit of the dividend. It's just that they get it in the form of a lower price on the option instead of paying a higher price and getting the dividend in cash. The form doesn't matter. The final result is that *they* get the [benefit of] the dividend, not the policy holder. And they are up-front about it. They don't try to hide it, they say right up front that "dividends are excluded when calculating the index return." It's just that (most) people don't realize what that means and the huge effect it has. Dave, you won't ever be convinced (cue the Upton Sinclair quote "It is difficult to get a man to understand something when his salary depends upon his not understanding it."). ::shrug:: These are an expensive instruments, sold to financially unsophisticated people, using sweet words -- "Stock market return without stock market risk" -- while rifling their wallets. By the time they realise (if they ever do) what's been done to them, the seller is long gone. First, thank you for posting some useful numbers about the range of S&P returns. I will accept you "fuzzy handwaving math" and agree with your rough estimate that: "33% of the time the excess gain was 11% and 28% of the time the avoided loss was 14%, so using handwaving fuzzy math that's pretty close to a wash." This is pretty much what I assumed but it nice to see the actual numbers. However,your statement - "SOMEBODY took the loss when the market lost, and if it wasn't you then it was the IUL company. Likewise, SOMEBODY got the excess gain, and if it wasn't you then it was the IUL company." - is still an inacurate description of the situation. As I explained in my first post, the gains are all made by purchasing options. If a call option expires worthless in a market that dropped 14%, neither the IUL owner nor the company loses 14%. The only loss is the cost of the option; and the funds to purchase that option were generated by fixed income securities. Likewise neither the policy owner nor the company got any excess gain. When the original "at the money" call option was purchased, a second "out of the money" call option was sold - creating a classic bull spread and capping the max gain on the trade. If the market soars 30%, the excess gain above 15% is captured by the purchaser of the "out of the money" call - which is neither the policy holder nor the company. Next you state "the total return of the S&P500 is not just the price. It also throws off dividends, about 2.6% a year average." That is totally correct, and when taken with your previous data, would imply that simply buying an S&P index and collecting the dividends would beat a 0% floor/15% cap IUL strategy. However, you go off into the weeds again with the comment "The market paid a dividend and SOMEBODY received it, and if it wasn't you then it was the IUL company". The company never bought the index (only the call option), therefore they did not receive any dividends. That actual owners of the stock, whoever they be (but in our case clearly not the policy holder or the company), received the dividends. The real question I have is: do the insurance companies truly use all of the alvailable funds generated by the fixed income securities to create these call spreads or are they skimming some of the income off the top? For example, if you have a $100,000 in your policy and their bond portfolio generates an average return of 5%, they should take that $5,000 to create the best option spread with the highest possible cap. But maybe they are only using $4000 to buy the options and keeping $1000 for themselves. In my mind, that is a valid concern and as a consumer I have no way to find that out. Now you have provided some nice data to suggest that simply buying an index, taking all of its gains and loses, and collecting the dividends provides superior returns to this IUL option strategy - this is most likely correct. The one caveat is the potential tax implications. Within the IUL, gains and distributions(loans) are tax free - not so with most other types of accounts(roth IRA being an exception). What is better an 8% tax free gain or a 10.5% gain being taxed as a combination of capital gains and dividends? That can only be answered using very specific individual data. Again, I believe IULs to be a very complicated financial instrument that is not suitable for most investors. They might be appropriate for the high net worth/high income tax bracket investor that wants easy access to all of the funds at any time. Like most financial and insurance products that are sold on commision, the worst offenses are probably rleated selling them to people that have no business buying them. But nothing I have researched or read on the topic has led me to believe that these products are simply "snake oil" or a scam. As I originally said, I have no dog in this fight - I neither sell these products nor do I own them. I do believe however that, at a website dedicated to financial education, such products should be discussed honestly and understood to the best of our abilities. Your Google reference was complete non-sequiter... was there a point hidden in it somewhere? Again, you can do a fancy dance all you want, but you can't provide *ANY* strategy to outperform an IUL over 15+ year rolling average periods... tax and risk weighted. I *am* diversified among strategies myself, so your attempts to accuse me of tunnel vision falls flat. I have a background as a hedge fund trader myself, so I am not without the savvy to know what to look for that works, and what is religious faith-based fundamentalism & casino marketing. Its rather ironic you accuse *me* of being beyond convincing... I look high & low, ongoingly, for the best risk & tax-weighted bottom-line long-term results strategies... and wherever I find advantages, I take them. I very much love finding unfair exploits, and I bring them out to everyone who will listen when I do. You have some kind of faith-based religious aversion to IULs. It makes itself very apparent in the way you repeatedly fail to grasp the details of how they actually work, and continually argue from ongoing mistaken assumptions. Its *OK* though... its just unfortunate. It does provide me a "foil" though with which to to detail out the facts... which is *FORTUNATE* for the savvy lurkers reading along... and there are frequently far more than you may realize. Actually, all of the IUL companies (due to the nature of the universal chasis design) are required to fully disclose not just their corporate financials, but the broken out sub-parts, fees, and charges of their IUL contracts, and project those disclosures forward generally through age 120 of the client. I can tell you, as a matter of financial fact, the numbers in regards to your question for one of the current top performing IUL carriers; Allianz Life. Now you have provided some nice data to suggest that simply buying an index, taking all of its gains and loses, and collecting the dividends provides superior returns to this IUL option strategy - this is most likely correct. Nope, its incorrect by a significant degree, unfortunately. The IUL carriers unfair advantage comes from tax law that allows them to allot their general account yields to new client money, as well as significantly expand the tax-free contribution and distribution rules for the individual. This 'unfair advantage' puts the IUL rolling average real dollar returns at superior performance the overwhelming majority of the time. Within the IUL, gains and distributions(loans) are tax free - not so with most other types of accounts (roth IRA being an exception). What is better an 8% tax free gain or a 10.5% gain being taxed as a combination of capital gains and dividends? That can only be answered using very specific individual data. Not to mention that if the insured dies, his estate gets a multiple times bigger payoff than the beneficiary of an IRA account. Example: Insured funds a policy with $100,000 which buys $400,000 face value life insurance. In addition, an Accelerated Benefits Rider makes the full face amount available in the case of terminal, chronic or critical illness. In addition, an Accelerated Benefits Rider makes the full face amount available in the case of terminal, chronic or critical illness. Except in California, where ABRs aren't allowed to be attached to IULs. The company never bought the index (only the call option), therefore they did not receive any dividends. That actual owners of the stock, whoever they be (but in our case clearly not the policy holder or the company), received the dividends. Derivatives are complex and difficult to grok. Which means it is easy to misunderstand them throughly. Investing in an instrument that you don't have a complete and accurate understanding of -- generally means that you are gonna get whacked sooner or later, completely unexpectedly. The holder of a call indeed doesn't directly collect the dividend, true. But he does, however, indirectly get the dividend by the fact that the price of the option is lower than it would be if the stock didn't pay a dividend. So this is one of those areas where the literal truth is false in effect. Which generally results in the contents of your wallet being transferred to a counterparty who *does* accurately understand the big picture. A sells a call to B. A is therefore net neutral. Buying the stock makes him long. Selling the call makes him short. The short cancels the long, so he is neutral. Being long means you collect the dividend. Being short means you *pay* the dividend. Being neutral means that you neither collect or pay the dividend. A is neither long nor short. Which means that B is long. Which means that B receives [the benefit of] the dividend. When you follow it all, you'll see that it *has* to be this way. Otherwise there would be a risk-free opportunity for somebody to collect the dividend while being neutral in the stock. But there is only ONE dividend, so that would mean that somebody else would be long the stock but would *not* receive the dividend. It would be neat if you could buy a stock, short it, and still get paid the dividend. But unfortunately it doesn't work that way. The real question I have is: do the insurance companies truly use all of the alvailable funds generated by the fixed income securities to create these call spreads or are they skimming some of the income off the top? ... In my mind, that is a valid concern and as a consumer I have no way to find that out. Doesn't matter, and is of no concern. Yu don't need to "find that out" because it is immaterial to you. The contract says that the policy holder is paid based on what the index does. It says nothing about how the company invests the money. They could buy calls, they could buy gold, they could buy Mongolian yak milk futures. How they make their profit is their problem, not the consumer's. All the consumer cares about is that he gets paid what he is supposed to -- he doesn't care how the company got the money. So, nope, won't work. Too many complicated moving parts to quickly identify the one key part and say, "That right there is why it won't work." It's not worth the time, and the true believers won't listen anyway. This whole topic is so similar to the various discussions of "money merge" accounts. The proponents keep bringing up non sequiteurs and complex money movements, and they shift the ground whenever somebody points to a flaw. Highly entertaining -- if you are entertained by that sort of thing. 'course, that's a scam. I'll grant that IUL's aren't a complete scam. A stupid investment, though. "The market paid a dividend and SOMEBODY received it, and if it wasn't you then it was the IUL company." "The holder of a call indeed doesn't directly collect the dividend, true. But he does, however, indirectly get the dividend by the fact that the price of the option is lower than it would be if the stock didn't pay a dividend"
Nobody was claiming that options pricing isn't affected by whether the underlying security pays a dividend. But your original claim that the insurance company was actually pocketing the dividend payments was simply false. However, the "discounted" cost of the option does directly relate to my previous question: "do the insurance companies truly use all of the available funds generated by the fixed income securities to create these call spreads or are they skimming some of the income off the top?" For this sytem to work best(provide the highest possible cap) for the policy holder, you want to use all of the funds generated by the fixed income securities and buy the call options as cheaply as possible, so that you only need to sell a really far out of the money call option - thereby giving you the maximum cap possible. Your recent post states: "The contract says that the policy holder is paid based on what the index does. It says nothing about how the company invests the money. They could buy calls, they could buy gold, they could buy Mongolian yak milk futures. How they make their profit is their problem, not the consumer's. All the consumer cares about is that he gets paid what he is supposed to -- he doesn't care how the company got the money. "......Actually having read several IUL policies, I am pretty sure they state that they invest the money using the bull spread option strategy. And it most certainly is of concern to the potential investor how it is invested. If they claim to be using a bull spread options trade, but are actually investing in yak milk futures, this is fraud and may wind up blowing up like a ponzi scheme - not a company that I would invest with. Next, Dave provided an answer to my above question stating that:" Allianz Life's general account yield is approximately 6.5% They acknowledge taking an 80 bip haircut off the top before applying a 5.7% credit to the IUL contracts, from which the client can choose to keep all the 5.7% yield as a fixed credit, or apply any portion (up to all of it) toward a cap spread with a floor as low as 0% to a ceiling as high as 19%".....Now, that actually confirms one of my concerns with these products - on top of the loads, fees, and insurance underwriting profits, the company is also skimming 0.8% of the fixed income. That is a lot of friction to overcome to obtain decent returns. Now, let's put all of the dividend and yak milk nonsense behind us. I acknowledge that the returns are reduced by the lack of dividends and I hope you can accept that the company is truly doing a bull spread with the options. You did some nice back of the envelope calculations showing that simply buying the S&P index and collecting the divdends beats the IUL strategy with a 0% floor and 15% cap (I know Dave disagrees with this, but I think your numbers are reasonable). To that I posed the question: "What is better an 8% tax free gain or a 10.5% gain being taxed as a combination of capital gains and dividends?" And here the answer really will vary from one individual to the next. However, I suspect that there at least some individuals that would be better off with the 8% tax free gain. So the logical next question is: are they better off enough to offset the loads, fees, and cost of insurance? Again this seems to be a question that would require a lot of individulized information to correctly answer. But, by getting to this last question what is really being debated is whether IULs are an optimal, fair, or suboptimal investment option - whichever they be, clearly they are not the financial equivalent of a perpetual motion machine or a money merge account. KB wrote: You did some nice back of the envelope calculations showing that simply buying the S&P index and collecting the divdends beats the IUL strategy with a 0% floor and 15% cap. Why is 100% safety of one's principal getting such short shrift in this discussion? Why is no one mentioning the huge tax-free payoff--much more than I put in--to heirs when (not if) I die? I would much rather have my $100,000 (upfront policy premium) guaranteed against market risk with a 17% cap and a $400,000 tax free payoff to my heirs than collecting dividends that may or may not cause that taxable strategy to be better than the IUL. But that's just me. I'm a security addict. If you want $400K for your heirs, isn't a term live policy much less expensive? Seems that is what you buy insurance for. To some of us, passing money on to our heirs is not that important. If you live to be 100, the annual cost of insurance in the IUL must be astronomical. And, of course, if you let the insurance lapse, all the distributions and loans taken to date become taxable. I wonder why we don't hear more about these risks? Your heirs inherit $5 million tax free. The $400K tax free insurance payoff is only beneficial if it on top of $5 million previous tax free dollars. You can get safety by stuffing the money under your mattress. If that doesn't appeal, you can do the bull spread call option strategy yourself that caps the downside. Bottom line is these things are *crazy* expensive. I would have to run the numbers to be sure, but I'm willing to wager a steak dinner that after any reasonable period of time the insurance company winds up with more money of your money than you do. Hell, I'll go out on a limb and say the insurance company makes more money than you do without running the numbers. The fees as quoted by KB are enormous. You might as well attach a vacuum cleaner to your wallet. It is certainly possible that if you really drill down in some limited circumstances these things make sense. My rule of thumb is that if it isn't obvious that something makes sense, it probably doesn't make sense. You got some good replies -- all correct and all pointing out important factors that you are either overlooking or giving short shrift to. The problem with over-emphasizing "safety" is that you can fall for an illusion. The fact of inflation means that getting 100% of your money back in 20-30 years is a large loss in purchasing power. The exclusion of dividends is also a large cost. Over the last 25 years, that cut the total return of the S&P by more than half. 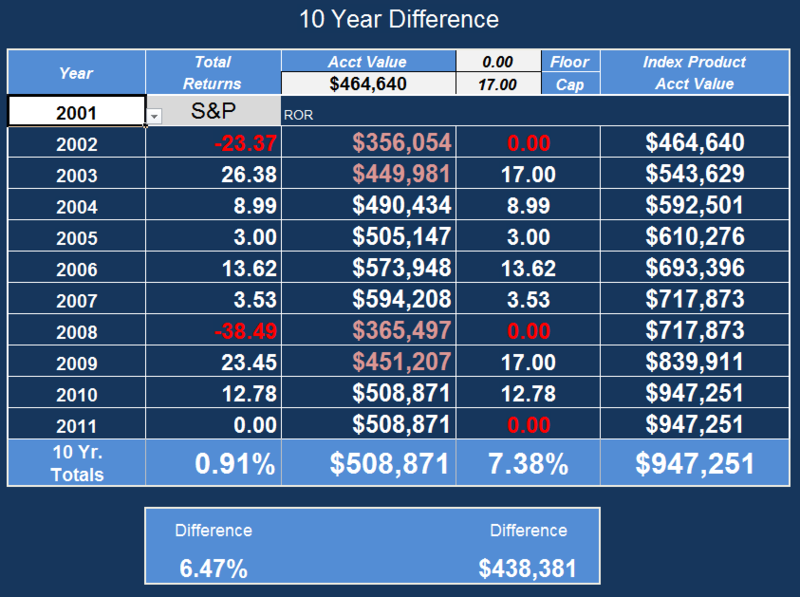 Your final account value would have been only 4 times the initial value instead of 8 times. That's a *very* expensive price to pay for the guarantee. Not sure how accurate that "17% cap" is, either. From what I read, many policies allow the ins co to unilaterally reduce the cap. Bottom line is these things are *crazy* expensive. If that's the baseline assumption, then getting similar financial performance outside of IULs is 300-500% of *crazy* expensive. Its all relative, I suspect, when the least costly method is considered "expensive." I would have to run the numbers to be sure, but I'm willing to wager a steak dinner that after any reasonable period of time the insurance company winds up with more money of your money than you do. Seriously? I don't eat mammals, but how about Anthony's? You can even choose your 30 year run to backwards fit whatever strategy you plan to apply. Loans defer both principal & interest for life. No repayment cashflow burden. Whoever finishes 30 years with the most net/net/net capital wins! This is like asking what NFL quarterback has thrown for the most yards who also has Tim Tebow's height, weight, and birthday. The answer is Tim Tebow. But it doesn't say anything about Tebow's meager abilities as an NFL quarterback, or even if you want him on your team. Unless you want the answer to be Tim Tebow is is a meaningless question. If our investment horizon is 30 years, then why do we care at all about capping market risk at zero in any given year? It is a nonsensical condition. We only care about the result at the end of 30 years. If your horizon is five years or less, then sure, it is something to think about. But 30? C'mon. And I already lost? Just the fact the index is excluding dividends neatly chops your potential upside in half. That's a hellvua hit! No tax savings will make up for that. The fixed portion currently offers 4.25%. Compare to Vanguard's long term investment grade bond fund (VWESX) distribution yield of 4.49%. Pretty much a wash.
Index Growth Cap is maximum rate used in the calculation of the Index interest Rate. We set the Index Growth Cap for a new segment on the Segment Start Date. The Guaranteed Minimum Index Growth Cap is 3%. That's interesting! The 12% cap is only fixed over one year, not 30. They can drop all the way down to 3%. Kind of hard to do the backtest if you don't know what the cap is. But you can be assured they jigger the cap for their benefit, not yours. I'm reminded of the halcyon days of the 1980s when regular UL's were all the rage. The salesman would show you have they were offering 12% and if you extend that out into the future 30 years your main problem would that you had park your car in the driveway because your garage would be filled with giant bundles of money. What really happened was that interest rates dropped and many people had underfunded policies they couldn't afford anymore and the policies went bust. As intrcst points out, that's that's a taxable event. Not good. A IUL might make sense in some circumstances with a 15% cap. Maybe. No way does it make sense at 5%. If our investment horizon is 30 years, then why do we care at all about capping market risk at zero in any given year? Because when you need your liquidity, and the markets down, you can't afford to be s.o.l. We only care about the result at the end of 30 years. In order to survive 30 years, your account has to survive 30 years intact. Trying to argue in *favor* of a mystical non-strategy supposedly superior to an IUL that nobody has yet brought forth, by randomly choosing any off-the-shelf unstructured IUL is pretty damning in the lack of argument itself. It is also unclear what the period is for the cap. Is it 12% a year? Or 1% a month? Or 4% a quarter? All these are 12% a year, but it makes a LOT of difference which one it is. 'course, when I see working like "Index Growth Cap for a new segment on the Segment Start Date", it makes me think that I'm gonna get screwed. The weasel wording indicates to me that "segment" is probably not the same as "year", because if they meant year they would have said year. But they didn't, and you have to wonder, "Why is that?" order to survive 30 years, your account has to survive 30 years intact. This is an example of the thing that has always driven me crazy about insurance salespeople. In one breath they talk about 30 years, in the next they talk about some shorter term. They keep shifting around the time-frame to meet whatever question or objection you have. Likewise, they shift between talking about retirement income, leaving money for heirs, and tax savings, to meet whatever question or objection you have. It's like the combination playpen/highchair/walker that new parents get sucker into buying. The salesman makes out like it's a playpen and a highchair and a walker, but it's not -- it's a playpen OR a highchair OR a walker, and when it's filling one purpose it is not filling the others. Moreover, it does each one poorly. Trying to mash several different objectives into one financial instument is going to cost more and have worse overall results than buying several instruments that each do their one job well. FWIW, "The August 10, 1998 issue of Barron's reported that worst 30 year period for the S&P 500 since the end of World War II (1955-1984) had an annual return of 9.4%." "Forgoing the majority of your projected return to protect yourself against an event that hasn't occurred in recent history is very expensive insurance." It is well known that the optimal strategies for short-term returns are different than for long-term returns. Strategies that focus on low volatility harm your long-term returns. And that's *just* what IUL's brag about, the low volatility and the no-loss floor. Flag on the play. You're the one claiming these IULs do all these great things. Fair enough. But since you're keeping the details secret, somebody else has to go looking for the particulars. That being the case, you are in no position to complain if someone actually finds them. If you have a different policy in mind, then the time to fess up was two posts ago. As I mentioned, since the top cap is variable based on unknown factors (but no less than 3%!) we can't make any reasonable estimate about future 30-year returns because we have no idea how they calculate the top cap. My guess it is based on insurance company profits, but who knows? And since these things have only existed for a decade or so, we have scant historical performance information to use as a comparison. Sometimes things don't make sense at face value, but when you drill down you find out there is a higher level of understanding that pulls everything together. IULs don't make sense at face value, and as you drill down, there are more and more questions, gotchas, and hidden problems you didn't know about before. As a rule of thumb if you have no idea how the terms of deal are calculated and the other party isn't willing to tell you...probably not a good deal for you. It only sounds like "weasel wording" if you refuse to educate yourself on the instrument... exactly the same as terminology around other common financial instruments. Nobody is arguing in favor of some other specific strategy. OK, so we finally have it out explicitly; Nobody has anything that can outperform the features of an IUL... fine. You simply can't accept what you can't understand, and you can't understand the trade method and tax law that makes IULs outperform. OK. EXCEPT FOR all the alternative methods to get the same performances. Strategies that focus on low volatility harm your long-term returns. Except when they don't... but you don't understand the process, so you'll never accept it. You're the one claiming these IULs do all these great things. Fair enough. But since you're keeping the details secret, somebody else has to go looking for the particulars. Nobody's kept *anything* secret... have you not read any of the threads on IULs that I have provided exhaustive broken-out explanations on? Seriously... zero secrets. Whatever you don't understand, ask. As I mentioned, since the top cap is variable based on unknown factors (but no less than 3%!) we can't make any reasonable estimate about future 30-year returns because we have no idea how they calculate the top cap. My guess it is based on insurance company profits, but who knows? Anybody knowledgable knows, pretty much exactly like every other asset class. Again... zero secrets. Whatever you don't understand, ask. I'd re-answer the questions you bring... but they're already answered by me and others *IN* this very thread, and others I know you've participated in... just scroll up! Generally agree, and that principal applies pretty much universally. HOWEVER, the lack of mechanical capability of understanding doesn't mean something doesn't actually work, nor that you can't benefit from it. You don't have to understand computer engineering to participate on TMF, for example.